The Association was founded in 1996 by Mr Richard Broad, Mrs Medwin Broad & Miss Jayne Vowles (retired 1999). Our aim has always been to put the fun back into showing and provide exhibitors with shows and classes that cater for all types of equines and competitors. SWPA runs a very full programme of shows starting in February/March, and continuing with shows in April, May, June, July and September (championships), all held at various venues in the South West and Wales regions. At all our shows we try to offer a wide range of classes for all types and breeds of equines, and we hold a wide range of TSR, NPS, PUK, Equifest, VHS, TGCA & BMHS qualifying classes. At our Welsh Show we have qualifiers for The National Welsh and Part Bred Welsh Championships. Every show holds a full range of SWPA qualifying classes, including our prestigious Supreme In-Hand & Ridden Championships and our Native Medal Finals. Since starting in 1996 we have added many new Championship classes to cater for the wide variety of equines our members have recently adding classes for World Breeds and Hill and Moorland ponies for those natives unable to be shown under native breed categories. Our continuing success meant that in 2002 we had to move our Championship Show to a larger venue, and relocated to The David Broome Event Centre at Crick, Monmouthshire. Since then the show has grown from a two day to a four day show with over 700 classes, and three ‘Evening Performances’. Our Native Medal, SWPA Supreme In-Hand Championship and SWPA Supreme Ridden Championship continue to go from strength to strength, with exhibitors eagerly trying to qualify for these prestigious events. Qualifiers for these three championships are held at SWPA shows only. Our recently introduced Home Produced Series is proving very popular, and our ‘Star for the Future’ series remains an important part of our show. 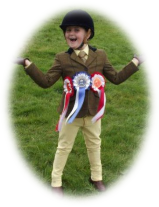 The ‘Evening Performance’ classes on Thursday, Friday & Saturday are the stage for all our major championships but also include many ‘fun type’ classes including, Adult & Child Ridden, Concours d’Elegance, Ridden Pairs etc. along with classes for Lorry Dogs and the main event on Saturday Evening, Wheel Barrow racing. So, why not come and join an Association which aims to bring the ‘FUN’ back into Showing. Please follow the links to find out more about South West Pony Association.